The Working Circle Indians of North America (AKIN) is primarily dedicated to promote the human rights of North America’s Indigenous Peoples. Through political engagement AKIN is contributing to improve the legal situation of Indigenous Peoples, particularly their right to self-determination. AKINs activities are based on personal contacts and direct coordination with indigenous representatives from the USA as well as from Canada. 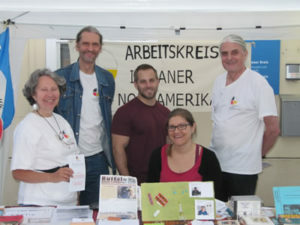 In addition, a network with similar European NGO’s – primarily from Germany, Switzerland and France – has been established in order to increase effectivity. Joint advocacy at the international level such as within the United Nations system and affiliated organizations like the World Intellectual Property Organization (WIPO) is AKIN’s core issue. Furthermore, still dominant clichés and stereotypes have to be replaced through serious information. As a matter of respect, AKIN solely mentions spirituality if it is related to political activism, coordinated with affected Indigenous Peoples‘ representatives and consented by them. Being a human rights organization, AKIN emphatically supports, promotes and insists on the political, cultural and economic self-determination of Indigenous Peoples. 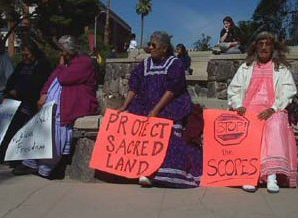 It strictly opposes and condemns any commercialization of Indigenous Peoples‘ cultural heritage, particularly the esoteric exploitation of Indigenous Peoples‘ spirituality. Together with like-minded human rights organizations on Indigenous Peoples, AKIN has compiled a set of common principles on which all support work is based on. It has to be stated very clearly already at this point, that although the group is using the term ‘Indians’ it does not really identify itself with this word. Firstly, because it is a non-indian term, secondly, because it is misleading, making one believe that all Native Americans are more or less one people. To get potential supporters interested the group has to use this name for tactical reasons. North American Native Peoples are only known under the term ‘Indians’ in Europe. People, we would like to involve in our work, would not really understand what we are talking about, if we would use ‘Native Americans’ or ‘First Nations’ instead. It needs a second step to explain this and the group is putting much emphasis on that. North American „Indians“ are a part of what is referred to as „Indigenous Peoples“ in international legal terms. It is typical for their situation – and also for similar groups in other continents – that the governments of the countries they are living in, for different reasons put extreme pressure on the sovereignty and thereby the way of life of these people by violating human rights – not the least because of resources and because they simply may stand in the way of „progress“. Neither are they accepted as seperate Peoples with the right of self-determination (or maybe only on paper) nor can they profit from any form of international development policy and development aid. They do not constitute States (development policy and aid is a process between States, not Peoples) and – in the case of North American „Indians“ – live within industrialized countries. Thus, Native Americans have no formal chance to get anything out of official international support and institutions. 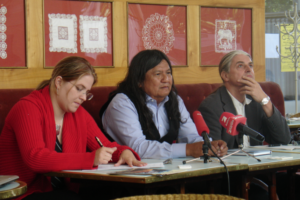 In 1980, the Russell Tribunal was held in Rotterdam/Holland about „Native Rights in both Americas“. There were a lot of activities before, and after this tribunal relating to „Indians“ all around Europe. In Austria it became obvious that a certain group of people was specifically interested and motivated and in spring of 1981 they agreed on forming a working group. Since then AKIN is meeting only with short interruptions every monday to exchange information, plan activities and to prepare publications. In Europe very strong stereotypes exist about „Indians“, which are very different from those in North America. Basically it is the „noble savage“ cliché which constitutes as a barrier for their international work. Even though they are more positive stereotypes, the motivation to support the cause depends strongly on how the „Indian“ delegations meet these stereotypes. Thus, the reduction of these stereotypes and at the same time the correction of information, officially supplied by the North American governments about the „Indian“ situation today, are important tasks for the group. If possible from an organisational point of view, „Indians“ themselves are to be given the chance to speak about their problems and activities at press-conferences, interviews, in schools or at other public presentations. These events are organized by the group, which sees itself as a mediator between „Indian“ wishes and the Austrian public. Direct support may mean fundraising to give financial contributions to „Indian“ politicians for fight for the rights of their people. Unfortunately there is little understanding, how important it is to give money for more abstract issues, like court cases, land- or water rights, travelling costs etc. There is even less understanding that it needs money to run a group like ours. Another form of support is the sending of petitions and letters, the texts of which in most cases have been composed together with the „Indian“ groups concerns in mind. From time to time AKIN is organizing demonstrations, when asked by „Indian“ people. Some of the major demonstrations were for the Lubicon Cree (Alberta/Canada), the Mohawks (Quebec/Canada) and the Wisconsin Chippewa (USA). At information desks the group sells various items, the profit of which is used to support specific „Indian“ projects-as little as it may be. All moneys are directly transferred to „Indian projects or handed to „Indians“ personally when in Europe. Beside the cooperation between our support group and „Indian“ people there is another form of international cooperation – between the European support groups themselves. 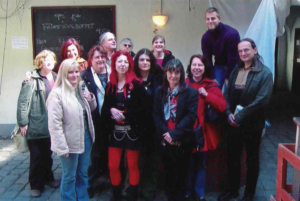 Since 1985 European support groups, especially in the German speaking areas of Europe are in close contact, exchange information, coordinate and plan actions. Together the organizations have compiled common principles all support work is based on. Since all the expenses are borne by the group itself, AKIN usually has a tight budget. Most of the money is needed for copying, phoning, and postal charges as well as possible traveling costs of native delegates. The members of the working circle have totally different backgrounds, in age and profession. Each member can contribute in the area, in which he or she is good at and/or interested in. So everybody is welcome!